Students at Mayanot’s Women’s Program in class with Rabbi Mordechai Guth, right. 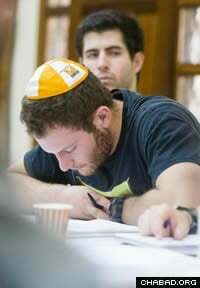 Nestled in the heart of Jerusalem, and long seen as an accessible starting point for young Jews looking to deepen their connections to their religion, the Mayanot Institute for Jewish Studies has had thousands pass through the doors of its campuses for young men and women since its founding more than a decade ago. In response to requests from students and young adults who visit Israel as part of the 10-day Birthright Israel tours, Mayanot’s Jewish studies program will now offer an intensive crash course on “Judaism 101” for those with little or no prior Jewish education. Moss adds that these students are looking for basic Judaism courses. “They want classes focusing on the Jewish holidays throughout the Jewish calendar year, Jewish philosophy or an introduction to Jewish mysticism. So the JSP is becoming more of a ‘Judaism 101’ course—an overview of all the basics and in the shortest possible time frame,” he notes. “It’s a very good way to catch up with the basics quickly. You start feeling more and more comfortable with your Judaism, and as you earn this confidence with who you are, the process of spiritual growth starts,” explains Illana Amzallag, who attended the women’s program in the Katamon neighborhood of Jerusalem, and who has since returned to her native France. Some students opt to stay for longer, often transferring to the flagship programs at Mayanot with a more rigorous study regimen. Mayanot's Jewish Studies Program now provides an overview of all the basics, and in the shortest possible time frame. One such individual was Joshua Levy, who came to Israel to “learn how to live as a religious Jew,” but had not decided where to study. Freshly discharged from the U.S. Navy with the rank of lieutenant, Levy had attended Hebrew school as a child, where he had learned the language, some history and a smattering of Yiddishkeit, he says, but wanted to deepen his understanding and observance of Judaism. 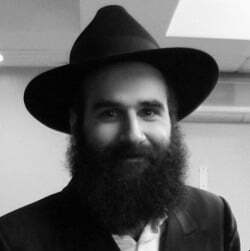 Upon attending a talk on Chassidic mysticism, he was hooked. After spending six months in the Men’s Jewish Studies Program in the Mekor Baruch section of Jerusalem, Levy transferred to the yeshivah program there. “It was an easy transition from the military structure to the yeshivah structure,” says Levy, who spent hours every week painstakingly learning the meaning of every word of the Hebrew daily prayers with a study partner. Although the lion’s share of the yeshivah schedule is devoted to Torah study, Levy says that the informal gatherings called farbrengens—where staff and students would sing, share words of inspiration and stories—pulled him in. This same sentiment was echoed by Amzallag, who notes that personal connections with her teachers made her experience extra-special. “More than what they teach, the way they teach, with warmth and care for each of the students, made a huge impact on me,” she says. As the second-largest provider of Taglit-Birthright Israel trips, bringing more than 5,000 young people to Israel every year, Mayanot educators hope that the new curriculum will make the program more accessible for students wishing to remain in Israel beyond the 10-day free tour offered by Birthright. Perhaps the most practical course will be “Judaism Basics,” offered by Rabbi Mordechai Guth, where students will explore the fundamentals of Judaism in practice and thought. They will cover major commandments like Shabbat, tefillin, Torah study and prayer. They will also explore Judaism’s core beliefs, the Jewish calendar, lifecycle events and an overview of halachah (Jewish law). Yet the program promises to be anything but dry. In fact, there will be courses devoted to more obscure topics, such as letters written by medieval rabbis and other little-known aspects of Jewish tradition, as well as walking tours of Jerusalem, where students will discover the city with expert tour guides. Students, faculty and administration of Mayanot’s Men’s Program.